MH Purity WordPress Theme is ideal to create stylish online magazines, news websites, professional blogs or other editorial related projects. The theme is built with performance and SEO best practices in mind and comes with custom widgets, advanced and easy to use theme options, color options to create your own color scheme and many more. MH Purity WordPress Theme is a modern, stylish, fully responsive and seo optimized premium magazine WordPress theme for fancy online magazines, news websites, modern blogs and other editorial websites. The theme has a clean and minimalistic styling and includes custom widgets, easy to use theme options, colorpickers with unlimited colors to create your own color scheme and many more. MH Purity WordPress Theme is the perfect solution for bloggers, journalists and editors who want to create amazing content and then present the content within a clean, modern and minimalistic design so that readers can focus on the content, without distracting site elements. All features and options of MH Purity WordPress Theme can be configured and customized very easily within a few minutes. This theme has been coded with care by using valid HTML5, CSS3 and PHP code and by keeping performance best practices and WordPress coding standards in mind. 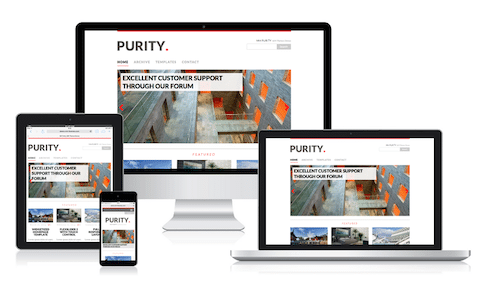 MH Purity WordPress Theme is fully responsive and looks great on desktop and all kind of mobile devices like iPhones, iPads or other smartphones and tablets. The theme has included a fully widgetized front page template and several widget areas where you can place WordPress widgets, custom widgets or advertisements. MH Purity WordPress Theme includes the popular and fully responsive FlexSlider 2 with touch control on mobile devices and desktop computers with touchscreen. MH Purity WordPress Theme has been coded with keeping SEO best practices in mind to create a solid fundament for good rankings in search engines. You may customize MH Purity WordPress Theme in every way you want. Files to create a child theme are already included in the download package. MH Purity is translation ready and supports all languages that are supported by WordPress, including languages written in a Right-To-Left direction (RTL Support). WordPress 4.7+ ready, support for all modern browsers (IE8+, Firefox, Chrome, Safari, Opera) and tested to work flawlessly with WordPress Multisite Installations. MH Purity WordPress Theme is distributed under the terms of the GNU GPL license. You may modify and customize this WordPress theme as you like.